The 2018 season is officially over for Los Angeles Angels starter Garrett Richards. The Angels announced Thursday night that Richards will undergo Tommy John surgery to repair a torn UCL in his right elbow. Richards left his start Tuesday after just 2.2 innings with irritation in his forearm. Richards sought a second opinion after an MRI showed a UCL tear. However, he has decided to undergo Tommy John surgery. The procedure will keep him out for the rest of the season and most of 2019. Richards is no stranger to elbow problems. In fact, Tommy John appeared to be inevitable for him. Richards was diagnosed with a UCL tear early in the 2016 season. However, he opted to receive platelet-rich plasma injections rather than undergo Tommy John surgery. He didn’t make it back the rest of the season but he did return for the start of the 2017 season. However, Richards was sidelined just one start into the 2017 season with a biceps strain. He didn’t return again to the Angels until September. In both 2016 and 2017, he made just six starts each year but was effective when he was able to pitch. Richards finally appeared to put his injury woes behind him this season. Other than a minor hamstring strain, he was able to stay on the mound and pitch well. In 16 starts this year, Richards went 5-4 with a 3.66 ERA. Until now, he helped to hold together a pitching staff that has once again been decimated by injuries. 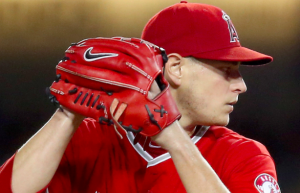 For the Angels, Richards is only the latest pitcher to require elbow surgery. J.C. Ramirez, Kenyan Middleton, John Lamb, and Blake Wood have all undergone Tommy John surgery this season. There is also a chance Shohei Ohtani will require surgery as well. The loss of those pitchers, among several other injuries, has made it virtually impossible for the Angels to remain competitive this season. After a promising start, the Angels have fallen to fourth place in the AL West. Losing Richards may end any hope of the Angels making a playoff push in the second half. The Angels also could have used Richards as a valuable trade chip over the next few weeks to help them rebuild their farm system. For the 30-year old Richards, the surgery adds great uncertainty to his career. He is set to become a free agent this winter. Obviously, his stock will drop considerably coming off the surgery, especially with no guarantee he’ll be able to pitch in 2019. When healthy, Richards has performed like a frontline starter. However, he will soon find his career at a crossroads as he undergoes Tommy John surgery in hopes of finally correcting long-term elbow problems.